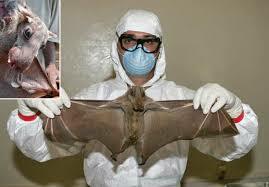 While the host of Ebola virus has not been officially identified, and the first appearance of human outbreak is also still unknown, researchers believe it can been found in mainly in fruit bats and also other animals including, chimpanzees, gorillas, monkeys, antelopes, porcupines, rodents, dogs, and pigs. Although this may seem irrelevant to us, it can be easily transmitted to humans. For instance, in hunting if you were to kill an animal carrying Ebola and then eat it there is a high probability you could be infected as well. The virus can’t be spread through the air from coughs or sneezes like a common cold, only through frequent contact with bodily fluids like sweat, spit, blood, etc. Also, the only person who can spread it has to be in the stage of Ebola in which symptoms are already shown. 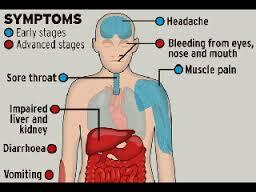 These symptoms include, high fever, headache, joint and muscle aches, sore throat, weakness, and stomach pain. 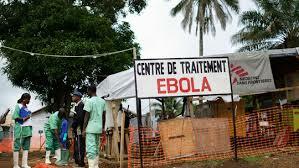 Nevertheless there are rare cases in which people spread Ebola before they know they have it. Ultimately, it causes levels of blood-clotting cells to drop, leading to severe and uncontrollable bleeding. While most of these cases are occurring in West Africa, doctors recently discovered a case, right next door, in Dallas. The patient, Thomas Eric Duncan, had just arrived in the U.S. from Liberia, where he caught this infectious disease. On his way home he was stopped at the airport to make sure he didn’t have any symptoms, which has become standard procedure for all flights out of West Africa. 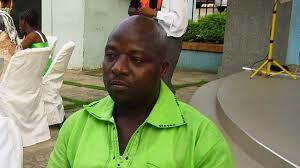 While he showed no signs of the disease, he was not truthful about his recent exposure to Ebola. Luckily researchers believe he couldn’t have infected anyone on his flight because he was not yet in the stage where transmitting Ebola was possible. He arrived in Dallas on September 20th, not showing any symptoms until the 24th when he first sought medical attention. He was examined and sent home with medication. His symptoms intensified, and Sunday he was admitted to the Texas Health Presbyterian Hospital of Dallas, where he still remains. A Texas Health Presbyterian Hospital spokesman said the patient has been in isolation since he arrived on Sunday. However he has had direct contact with up to 100 people, whom are now being strictly monitored by CDC (Centers for Disease control), since his return. The CDC director, Dr. Tom Frieden, considers that others may have been infected in the United States, but there is “no doubt” in his mind that the infection will be contained to the current patient and anyone he may have had contact with. Hospitals all around North Texas are preparing for any cases that may potentially occur, just in case, so they can contain Ebola as much as possible. Although this devastating disease has taken the lives of many in Africa, doctors are doing everything they can with the vast amount of resources they have to heal Duncan. The U.S. only has four isolation units fully equipped to care for extremely contagious diseases, such as Ebola, but the CDC insists that any hospital can safely care for someone with Ebola. Researchers say is not something to panic about due the tight surveillance Duncan is under and the fragility of the disease. But on the other hand, this can be concerning to us considering that it is happening in our own backyard. In addition, recent reports indicated this individual might be charged criminally for his decision to omit information on his exposure to the disease before leaving Liberia for the U.S.